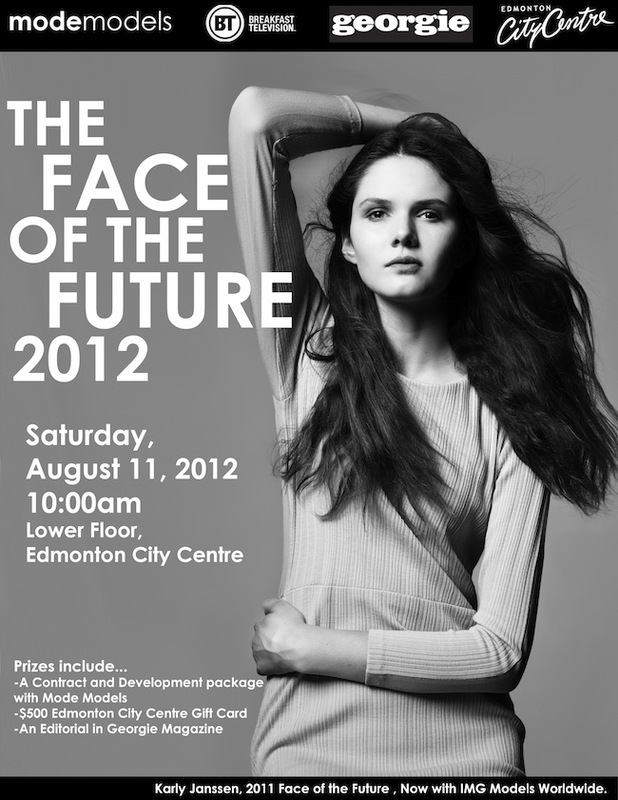 Want to be Edmonton's next top model? Here's your chance. This Saturday, thousands of hopefuls will flock to Edmonton City Centre to audition for Mode Model's Face of the Future contest. Out of the masses, five finalists will be chosen to compete live on Breakfast Television in a series of modelling challenges to see who has the potential to become an international model. On Tuesday, you can catch Dress Me Dearly live at 7:40 am on BTV talking about City Centre fashion and the looks I've styled for each model in their runway challenge. "We're looking for a model who is unique, inspiring and directional, who can take on the international modelling market in 2013," says Mode's Edmonton Agency Director, Michael Meneghetti. Last year's winner, Karly Janssen is now working with IMG Models. "Karly had of course, her amazing high fashion body, as well as an interesting and gritty edge to her. She looked better and better each photo," says Meneghetti. Registration begins at 10 am and Mode recommends applicants come in fitted clothes, minimal hair and makeup, and not be afraid to show their personalities and what makes them unique. The Face of the Future winner will walk away with what some models work their whole lives for - a modelling contract with Mode Models International and an editorial spread thanks to Georgie Magazine. Edmonton City Centre is also hooking the winner up with a $500 gift card. Not a bad start to your career, hey? Good Luck to all the contestants! I look forward to meeting the finalists on Tuesday, August 14 on Breakfast Television! Be sure to tune in at 7:40 am.